While attending a local art show in Powell River, I was chatting with an artist who, after finding out I was a sailor, posed the question: What did I think of the idea of offering a painting experience to adult students aboard a sailboat? Sounded like a great idea to me. I agreed to pursue it by contacting Cooper Boating in Vancouver, which also has a bareboat-charter base in Powell River. Our intention was to provide an “all inclusive” package of spacious accommodation and gourmet meals, in addition to art supplies and instruction. 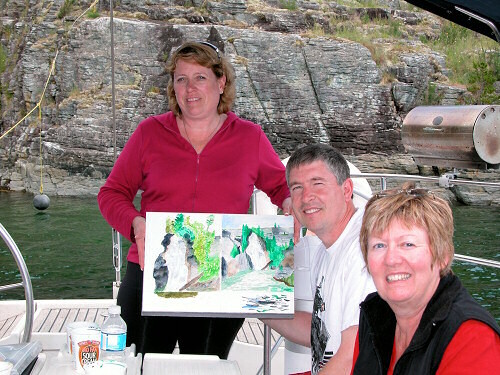 The focus would be on watercolour painting but participants could also choose to assist with the sailing, hike, swim, beachcomb or just relax and soak up the scenery. Before you could say “painting plein air,” I had chartered a 50′ Beneteau and signed on Barb the artist and three wannabe painters who had seen my ad posted around town. Doug, an experienced sailor and gourmet cook, was hired as crew to “cater and pamper” as requested. Pam, Vic, Greg, myself, and occasionally Doug (if he wasn’t busy in the galley) were to be the students. 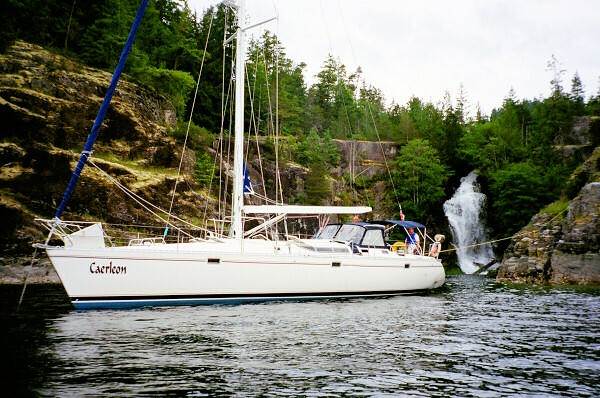 We would spend five days in Desolation Sound at the northern extremity of the Strait of Georgia between Vancouver Island and the mainland. A disenchanted Captain George Vancouver named this area, in June 1792, after arriving on an overcast day and seeing no sign of human habitation. In spite of its foreboding name, Desolation receives loads of sunshine during the summer months and has become an extremely popular destination for West Coast boaters … George wouldn’t recognize the place! Natural beauty abounds with snow-capped mountains, fresh water lakes, majestic waterfalls, and indescribable scenery at every turn, just waiting to be captured by our budding artists. As a long-time sailor, I seldom paid much attention to the details of scenery. Of greater concern to me was tweaking sails, avoiding rocks, checking tides and exploring new destinations. However, my brief but humbling experience with a paintbrush was about to change all that. Early June offered perfect weather as we cast off from Beach Gardens Marina, unfurled the sails and headed north on our painting adventure. I always enjoy the initial reactions of landlubbers when a sailboat begins moving silently and forcefully under the power of wind. “Wow” predominated the various expressions of wonderment worn by three of our group, followed by cameras clicking wildly at our full sails and the constantly changing shore scenes. After a few hours, we arrived at Copeland Island Marine Park, gateway to Desolation Sound. Deep water and minimal swing room in the main anchorage prompted a stern tie. Barb, a watercolour instructor at Malaspina University-College, was keen to begin her first lesson: an introduction to sketching and the vagaries of paints, pads, and brushes. Our assignment was to “experiment with colours” and become familiar with loading our brushes, blending colours, and seeing how the paints behaved on our pads. As a retired Psychologist, it became immediately obvious to me that our personalities were reflected in our individual painting styles. For example, Greg, an easy going que-sera-sera kind of guy, began making bold strokes on his pad, while my more controlled analytical approach to life had me painting the precise lines of a sailboat anchored nearby! Vic, a retired engineer, was more like me. Pam and Doug were somewhere in between. Other than the occasional sound of a boat motoring up Thulin Passage, the silence was eerie. Once Barb completed her instructional preamble, no one spoke a complete sentence for nearly half an hour. We each dipped our brushes, glanced toward our subject and made strokes on paper over and over until some semblance of scenery began to emerge. Comments like “Wow,” “Oh no” and “Oops” punctuated the silence as each painter found something that worked — or more likely, didn’t. Barb said later that all her painting classes are quiet once the brushes come out. It’s amazing how quickly the hours pass when you’re totally absorbed in creating a work of art, which begs the question: When does a painter become an artist? Obviously, not today! All four of us painting neophytes fell short of the mark, although we were all enthusiastic about our potential. Barb made some positive comments about each of our paintings, not yet suitable for framing! My intent was to spend our second day and evening in Roscoe Bay on West Redonda Island. However, a shallow bar at the entrance requires that we enter (and leave) at high tide, about 1600. We had a few hours to wait so we sailed to nearby Prideaux Haven and dropped anchor in peaceful Melanie Cove. Instead of painting, we opted to go for a hike and a swim at an unnamed pond, just north of Unwin Lake. The fresh water was surprisingly warm but access difficult from the marshy shore. After a relaxing lunch back on board and some lazing in the afternoon sun, we motored into Roscoe Bay and anchored our classroom near the entrance. Breathtaking views of snow-capped mountains across Waddington Channel provided an opportunity to observe what Barb referred to as “values,” or gradations of colour from pale in the distance to darker tones in the foreground. During our session, the colours continued to darken as a result of encroaching shadows from the setting sun. We pounced on this excuse to explain why our paintings did not quite match the colours of grandeur that lay before us. The next day, we took advantage of our harbour-locked situation to hike the short distance to pristine Black Lake for a refreshing swim and picnic lunch on warm sloping rocks along the shore. Afterwards, Barb had us practice techniques for depicting shadows, using an apple as a centrepiece on the cockpit table. We departed Roscoe Bay at high tide and sailed a couple of hours west to Cortes Island. Light winds, typical of summer sailing in Desolation, moved us along at four knots. No hurry, no worry. We had already completed our painting lesson for the day. The main anchorage at Squirrel Cove is a couple of miles beyond the entrance. This is one of the more popular anchorages in Desolation and often accommodates as many as 100 boats, but there were only about a dozen when we arrived. We anchored just off the reversing tidal-falls rapids and watched a couple of kayakers playing in the ebb current from an adjacent lagoon. On the fourth day, with our boat securely anchored and stern tied at the base of Cassel Falls in Teakerne Arm, we were about to experience our most challenging assignment: capturing motion. Barb suggested we leave the falls white to begin with and gradually introduce the underlying rocks in gradations of grays and browns to give the effect of flowing water. The intermittent shadows created by clouds moving across the sun added another dimension of complexity to the task. With brush in hand and my newly-honed observational skills, I was totally focused on every minutia of the landscape: shapes, colours, shadows, details of rocks, trees, water and sky all of which I’d almost totally ignored on previous visits. My job was to portray this dynamic three-dimensional landscape on a two-dimensional pad of paper — easily done with a camera but not so easy with a paintbrush. Doug and Pam engaged in friendly competition, each glancing furtively at the other’s work, ending up with remarkably similar paintings. Vic’s focal point was a huge log perched jauntily at the base of the falls, not a bit of water, sky or trees on his canvas, just a log painted in minute detail. Greg was still experimenting with bold strokes, so much so that he titled his finished work “Abstract Plein Air!” My creation was a good example of detailed mediocrity. Thank goodness for time restraints or I would still be there making one more tiny adjustment to a tree branch or rock. Just a few days ago, we’d had difficulty differentiating sky from water in our products. Now, we each had a less-than-perfect image of nature that, with an expensive enough frame, could be hung proudly … perhaps in the garage! After a night back in the Copeland Islands we sailed south, anchoring just off the sandy beach of Savary Island. A week after his visit to Desolation Sound, Captain Vancouver anchored in much the same location and was favourably impressed based on his dispatch to the King of England: “About sunset on a summer afternoon,” he wrote, “we sailed between the mainland and this Verdant Isle, which I named Savary’s Island. Here we landed and made camp on a delightful plain with a fine smooth beach before it that rendered the situation most desirable and pleasant, of a beauty as we seldom have enjoyed.” Isn’t it amazing how a bit of sunshine can alter one’s image of the world? We were fortunate in having sunshine every day of our cruise. I can’t even imagine what it would be like painting with watercolours in the rain! This was our last session and Barb instructed us to “paint with abandon …a day to play,” using vibrant colours and bold strokes. She suggested we try sprinkling salt on our wet paints to create a unique pockmark texture. It worked for me, although it might have looked better on the beach instead of the sky! Greg’s painting was judged to be the boldest of the bunch, a result of using all the paints provided, detail be damned. After lunch, we returned to Powell River with our personal portfolios in hand. 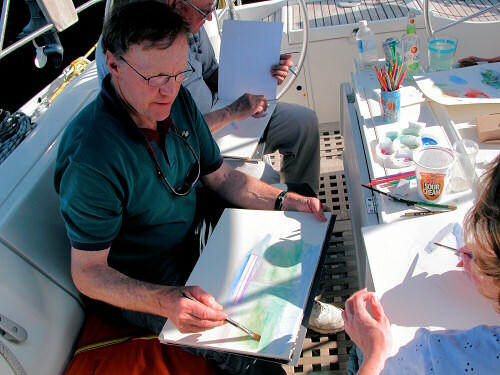 All participants agreed that this brief painting cruise was an exceptional experience, not only enjoyable and exhilarating, but also profound. Landscapes, we discovered, are an incredibly complex montage of colours, shapes and textures. Personally, I now take time to perceive and appreciate nature’s nuances. Even though I don’t yet paint like an artist, I’m at least beginning to observe like one! Also, I now find myself browsing art galleries in search of watercolour paintings, something I never did in my art-deprived past. The ability of some artists to capture reality with a paintbrush is truly inspiring. I can hardly wait for Watercolours 201!